We are a leading Manufacturer of fancy jute table runner, jute table runner and jute table mats from Kolkata, India. With the excellent support of our brilliant professionals, we are engaged in presenting Fancy Jute Table Runner. The major use of this table runner is found in hotels, restaurants and events. We are stitching a variety of table runner for the clients utilising better fabric and strong threads. Apart from this, clients can get the table runner from us at industry leading rates. 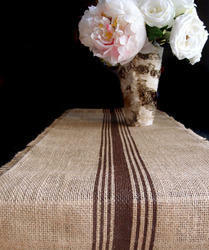 With the assistance of our deft team of professionals, we are able to introduce a broad array of Jute Table Runner. This table runner is designed and presented in a way to cater all kinds of customers and users. It is all-purpose table runner that can be used in hotels, restaurants and events. Furthermore, the quality jute fabric, print and the soft texture of the table runner provide comfort to the users. We provide you india's best skill handmade jute bags with multiple colours and design. 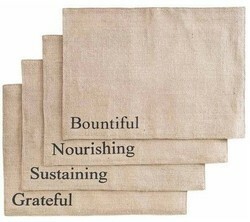 Printed natural jute table mats. 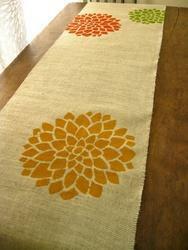 Looking for Table Runner ?